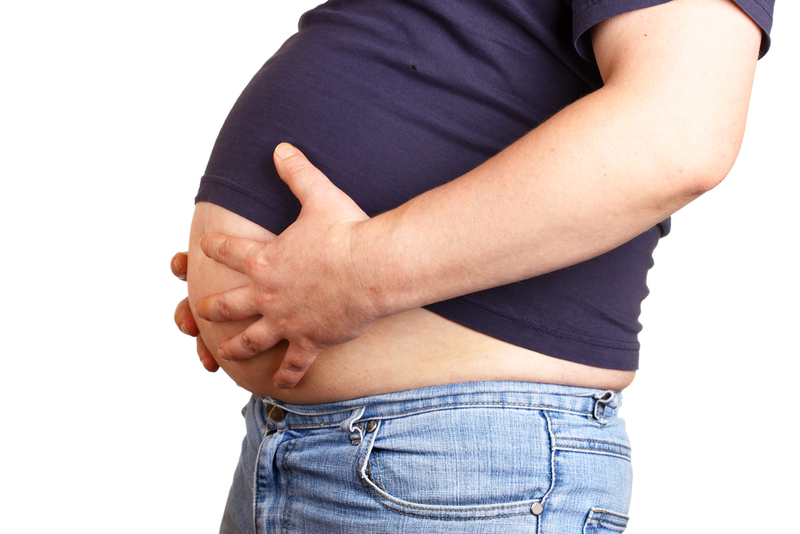 Belly fat, also called central obesity, is the fat around the waistline. It is more dangerous than fat located elsewhere in the body, Wikipedia said. There is a very strong correlation between cardiovascular heart disease and central obesity, according to Professor Anthony Goodman, in the Great Courses course Lifelong Health. In addition, central obesity increases risk of the following maladies: -type 2 diabetes, insulin resistance, many cancers, stroke, sleep apnea, high trigliceride levels and low levels of HDL cholesterol (the good cholesterol). A U.S. study in the May 2010 Annals of Neurology that examined over 700 adults found evidence to suggest higher volumes of visceral fat, regardless of overall weight, were associated with smaller brain volumes and increased risk of dementia, according to Wikipedia. So, how much is too much belly fat? It is generally accepted that a waist measurement above 40 inches significantly increases one’s risk. There are some variances due to height and body type. If in doubt ask your medical practitioner. To determine if you are an apple or a pear shape, measure your waist and your hips. If your waist measurement is larger than your hips, you are an apple shape. If less, you are pear shape. Dividing the waist size by the hips size is also indicative. Women with a 0.7 ratio have a lower risk of heart disease, diabetes and ovarian cancers. Men with 0.9 ratio or less have decreased risks including prostate cancer and testicular cancers. A big backside is better than extra fat around the waistline, and too little in the hip can lead to serious metabolic problems, the BBC reports. For example, the report says, waist fat breaks down quicker than fat in the thighs and backside, and that can trigger inflammation in the body. According to Professor Goodman, the ratio of waist to hips is a more accurate indicator of mortality or risk factors in older folks than BMI (body mass index) or waist measurement alone. How does belly fat increase risk of heart disease? “Fat isn’t an inert substance,” says the National Institutes of Health’s National Heart, Lung and Blood Institute’s Dr. Lauer. “It’s biologically very active tissue,” according to the Wall Street Journal item of May 3, 2011. Scientists believe that it releases a variety of toxins that can have adverse effects on blood vessels and the heart. Abdominal fat’s proximity to both the liver and the heart may also help explain how the damage is done. How to get rid of a big waist? First of all, “Spot reduction does not work,” Professor Goodman says. “Central fat is always the last to go for both men and women. Sit-ups, crunches and core abdominal exercises are great for general conditioning, but they have no effect on central obesity.” The body decides where the fat will melt from. Exercising the muscles underneath will not do it for you. He suggests that total body weight loss will bring you closer to a healthy standard and reduce your health risks. Finally, I mentioned Body Mass Index earlier in the post. I consider this to be a very misleading fitness indicator. Check out my post Don’t Get Hung Up On Your Body Mass Index to read further on it.